Not sure what size you need? See the explanation below. Thanks for using our free online Bullet Journal app. 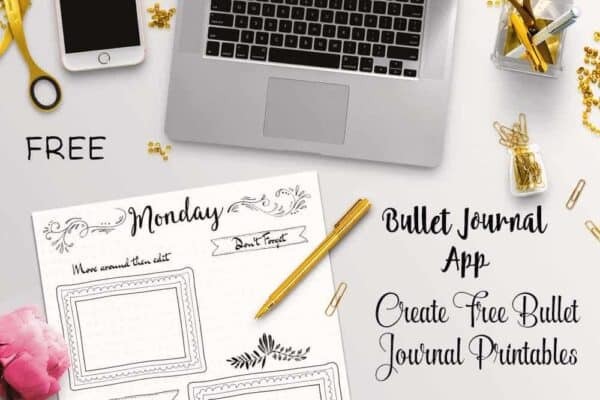 This app will help you create your own custom Bullet Journal printables from scratch within minutes and without lifting a pen! There are various sizes available to fit your bullet journal notebook including inserts for popular journal binders. You can also customize our templates and ideas. The app does not create a digital version of a bullet journal but rather creates a printable bullet journal that looks just like the one that you can take hours to create but it only takes a few minutes. Another advantage of the app is the flexibility. If you start adding elements and change your mind you can just erase them with the click of a button or move them around. This is certainly easier than making changes to something that you have drawn. Select the size that you need and decide if you want your background to be blank or if you prefer to use a dot grid background. All printables print on US letter size. There are hundreds of elements available such as frames, dividers, titles, arrows, date layouts, embellishments, etc. If you are not sure where to start then add a frame. It will help you decide how to break up the page. You can always erase elements if you decide that you don’t need them. Click on the black square under it. Add more elements such as titles, frames, dividers, arrows, banners, embellishments, etc. Move the elements around until you are happy with your page. Then print and/or download. Please note that the app does not create a digital bullet journal. 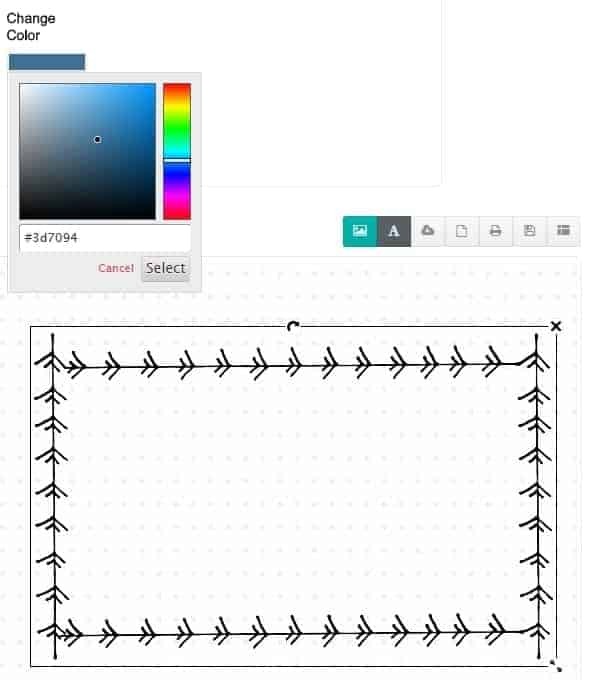 The software helps you create printable templates that can be filled out by hand in your planner. It saves you the time required to draw the template. It is created online but then used after it is printed. Create many printables in advance and insert into a binder. Print on demand and slowly add printables to your binder. Each new printable can be easily added to your binder. 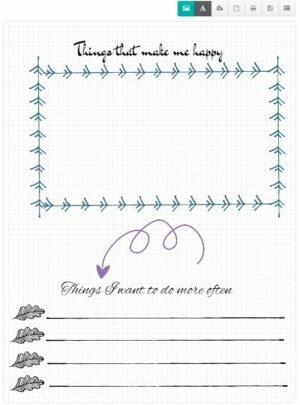 Create printables and copy them into your Bullet Journal notebook. The advantage is that you can play around with the layout until you are happy with the result and then copy the final product in your notebook. When you are not sure how you want your layout to look like it is a lot easier to make changes in the app than with a pencil and eraser. Make sure that you select the correct size in the first step. You cannot change the size after this stage. Don’t forget to leave a margin so that you will have space for the holes that you will require to insert into a binder. Print on standard paper and cut out your insert. Use a punch to make holes according to your binder’s holes. Insert into your planner or binder. Hi, I am currently creating my bullet journal but I am a little confused on how to create each printable. Do I create each as a separate file or how do I create each of the pages together? Each page is a seperate file. As you complete it downnload and/or print and then start on your next one. You can use the template you created for the next one and just change the day or month. Awesome thought so! Thank you! Where is the link I can’t find it in “stage 1”? Great ideas though! You need to click on the size that you want your bullet journal to be. Scroll down to stage number one. I’m having a problem printing the customized template. I selected the personal size but when I printed it, it still printed as legal size and not the size I want. How do I print the template in the right size I wanted? We are assuming that you are printing on legal size but the printable should show the cutting lines to cut the page to personal size with blank space in between legal size and personal size. You print on legal size but cut to personal size. I would like to have A4 format. What am I supposed to click to get to the app? Click on the size that you want to start.